Total comments posted to videos by users: 3,152, Almost 2,000 subscribers and hundreds of friends. was a well respected and loved member of the YouTube community, not only because of the valuable content that he provided, but also because of his support and engagement beyond YouTube and the videos in the cause to support and promote the works of Cirque du Soleil. But the content was one important factor also. The average rating of all the videos uploaded to the account was a whopping ???4.46??? out of ???5???. The sudden death was not only tragic, but also unexpected.?? What?? 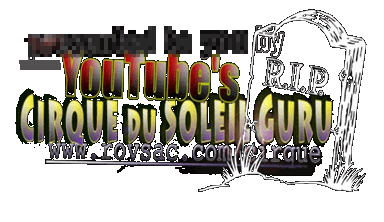 ?s now lost also with the death of CirqueDuSoleilGuru, represents hundreds upon hundreds of hours of work by me and other YouTube community members. All of which was destroyed and killed in cold blooded murder because of corporate greed, ignorance and disrespect of the average people, like me and you. The YouTube Publisher Account (Type: Guru) ???CirqueDuSoleilGuru??? was suspended on December 18, 2009 by Google without notice or stating any reasons for taking such dramatic actions. Two users and former subscribers to my channel already contacted me via other communication channels, like another YouTube account of mine or via private email and asked me what happened and how unhappy they are about this happening. I honestly don’t know what happened and why they suspended my YouTube account. I can only make wild speculations, but that is beyond the point. What makes me mad is the fact that the account was in good standing, no warnings, had almost 2000 subscribers, 3.2 Mio video views, over 3,000 video comments and close to 300 videos and gets suspended without giving any reason or anything. No email, nothing. Support generally does ignore things like that. I know that from past experience, which made me a lot more careful, without success obviously. It could be something that happened recently or something that happened months or longer ago. You simply don’t know. Considering the status and activity (content) of the account, you would expect that they would at least tell you what the problem is that you get at least a chance to do something about it. Nope, hundreds of hours of my time and time of YouTube’s users who commented on my videos gone. Not even worth a single email to them to let me know. The last email that I got was about a new subscriber to the channel. The last Email that I sent to YouTube just a few days before my account was suspended was an alert to make them aware of a scam that was abusing their system to trick users into installing some malware on their computers. This was happening on December 14, 2009. I also blogged about that at my personal blog. Well, you can?? see how grateful they are and how much they appreciate their users and how much they value the time that their users spend on producing and publishing videos on their web site. I have 3 other YouTube accounts, one has even more videos that my Cirque du Soleil channel had (but much less viewers and subscribers). I don’t know if I will start a new Cirque related channel on YouTube. The videos are still up on my File-share for download. Many are also available on other Video sharing sites. I have not yet decided what to do. I am also thinking about not to do much with video sharing sites directly anymore, but host the videos myself on Amazon S3 and put them on a new web site that I would have to create for this stuff. Video sharing sites would then only be used to promote that new site (teasers etc.) and not depend on them for the actual content distribution that much anymore. It would take a lot of time and eventually money as well. Things I don’t have plenty of at the moment. To take the time, I would need to monetize it early on to cover my expenses and pay at least for some of my time. I know quite a bit about this kind of stuff and thus know that it is not so easy in this particular niche. Regardless of this blog post, I have little hope that it will be resolved in a positive way, because YouTube/Google simply gives a crap about you. The traditional media outlet dinosaurs care even less about anything but how they can milk the consumer cow for hard cash as much as possible. With them is any discussion about the value of content and alternative options to come to terms with them a waste of time for everybody involved. For them is content, media and art nothing more (or less) than a bag of wheat, a commodity with a price label attached to it. Appealing to their responsibilities in society falls on dumb ears, because they are not in business to do anything good for society, but to maximize profits for their share holders and for themselves. I just watched yesterday a video about the history of YouTube (on YouTube) and had to laugh when they talked about the value and importance of “community” and the users who are active in it. Well, the video was not created by YouTube themselves, but some students. They obviously did not know better. The thing that pisses me off the most is the fact that I finished 10 or so videos, branded with “YouTube’s CirqueDuSoleilGuru” that I wanted to upload when I learned that my account was suspended. A “nice” Christmas present. You could try to help and contact YouTube to ask them about my account as a caring and appreciative user, who liked the content of my channel. I have no idea, if that might trigger that they take a second look at it, but it is not hard to do, does not take too much of your time and who knows, might works. You are now the second user who contacted me because of that. Maybe others will start wondering too and could join in too. You don’t have to do it of course, but I’d appreciate it really. PS. I just used YouTube?? ?s web form to request more information about the account suspension, which I also just found out about today, but have little hope to get anything back from there that would help in this situation, if I hear back anything from YouTube at all. So far YouTube/Google tends to follow the strategy of complete silence and ignorance when it is about unpleasant things they don?? ?t want to cope with. I did not want to speculate about why the account was suspended, but I found this post in Google Groups, which is interesting and says it all. There somebody stated it cold and clear that YouTube has the right to suspend any account at any time for any reason without any notice and that you are at their mercy from the moment when you created your YouTube account and agreed to their terms of services while doing so. It also states that a typical reason for an account suspension is their ???3-Strikes??? rule, where a strike is ONE video where somebody complained about and it was removed without you fighting against it on the legal battlefront. I had more than 3 movies that were removed from the account over the months and I stopped arguing with them in those cases, if there could be the possibility that the fair-use clause does apply. I did not involve a lawyer, heck no. I did all this stuff in my spare time as a hobby and to support Cirque du Soleil and the artists and not for profit. In some cases YouTube simply slammed additional ads over the video and shared the revenue from those ads with the alleged owner (or partial owner) of the content. I also got contacted by companies and individuals about the content of some videos. A few even were unhappy at first, but then realized that what I was doing was not to do them any bad, but the exact opposite. Anger tended to turn into appreciation and acknowledgement of the work that I had done for them without them asking or compensating me. Also Cirque officials contacted me through YouTube to send me information etc. in the hope that I would help them with the voluntary promotion of their stuff, if I liked it. This said, I doubt that Cirque du Soleil had any hand in this issue. You might would think otherwise, considering that the vast majority of the content at my CIrqueDuSoleilGuru channel was about or from Cirque du Soleil itself. It?? ?s all such a pain and waste.